I’m amazed at how many people are just adding my contact details to their email lists because I agreed to connect with them at LinkedIn. They don’t even ask permission – they just do it. That’s a big ‘no-no’ and should NOT be done. Note it states you will comply with all applicable laws, including…. anti-spam laws. Just because someone agreed to connect with you at LinkedIn does NOT mean they’ve agreed to subscribe to your mailing list. That’s another thing altogether and the anti-spam laws still apply. People should not be added to your lists WITHOUT their permission. You have to ask if they’d like to be subscribed and/or they may ask you if they can subscribe. But you cannot just willy nilly download your connections list to add to your mailing list. How many people are you connected to? What if every single one of those people added you to their lists? If you were connected to say, less than 20, then maybe not a problem. But what if you were connected to 200, 500, 1000 people or more? How would that feel to you? I expect, as your connections list grows, the probability of being added to lists without your permission is going to increase and that is frankly a waste of time for all involved. People should only be subscribed to your list when there is a known interest and agreement, preferably with them self-subscribing – not you just adding them because ‘they’re a connection’. Being connected provides opportunity to network (which is what LinkedIn is about) and getting to know those you’re connected to BEFORE you start asking them if they’d like to be on your list. Here are more articles for you to read on the same topic. All make valid points about this practice that is not a good one. You could end up being labelled a spammer with your emails being black-banned through various mail servers. Not something you want if you wish to grow your list and build your business. Can I add my LinkedIn connections to my mailing list? If you’re a service provider, helping clients build their lists, it is important you let them know that using LinkedIn connections the wrong way could cause damage to their business. Important they’re aware of that too. So, whether it’s your list, or you’re helping someone with theirs, do NOT add exported LinkedIn lists to your mailing list. You must have permission from each individual before they can be added. And the best and easiest way to do that is to provide a self-subscribe option so people can subscribe themselves. I’m amazed at how many people do not read the User agreement and rules for LinkedIn. Regularly I get added to people’s email lists because we’re connected at LinkedIn. Come on people! If I want to be on your list I will subscribe – you don’t need to add me. 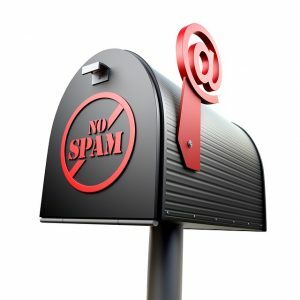 What don’t you get about spam and anti-spam legislation rules? Just because I’ve agreed to connect, does NOT mean I’ve also agreed to be on your list. I am connected to a few thousand people – what if every single one of them decided to add me to their email list? I get enough stuff now, I don’t need more – unless I choose to, on my own part. The rules for LinkedIn can be seen at https://www.linkedin.com/legal/user-agreement. Make sure you read them. It’s amazing how many don’t and how many I catch out because I know that they have added me to a list from LinkedIn connections. How do I know? Because of the way the email is addressed. If I self-subscribe I enter my name in a different way. There’s other stuff there too, worth reading, but really people, does it have to be spelt out to you that a connection at a social media or business tool online does not equate to someone coming to your site and signing up for your list. IT DOES NOT EQUATE, so don’t do it. Because I will report you as spam, especially if it’s not something I’m interested in. What’s wrong with wooing me first, letting me get to know you and learn about you at LinkedIn first? Showing an interest in ME and what I do. How many send personalised invitations? Very, very few. I have to ask people why they want to connect by messaging them as they simply just don’t bother. Well, if you can’t be bothered explaining why you want to connect, or even to chat with me online, what makes you think I want to be on your list? You’re a bit full of yourself aren’t you? And those who are in Australia, in particular, should know that the anti-spam legislation here will cop you a sizeable fine if you get a number of people reporting you for spam. If I feel this way you can be darned sure that others will too. So DON’T DO IT. Just don’t. Oh, and what’s the definition of spam people? irrelevant or unsolicited messages sent over the Internet, typically to a large number of users, for the purposes of advertising, phishing, spreading malware, etc. send the same message indiscriminately to (a large number of Internet users). I’ve been on LinkedIn now for just over 10 years and have seen a lot of changes during that time. When I joined there were only 14million members worldwide, now I’m connected to more than that at third level connection. In 2012 I received a certificate stating I was in the top 1% most viewed profiles. At that stage there were 200 million members. That meant I was amongst the top 2M people but it still sounded impressive. I had that certificate laminated and show it when doing presentations on the use of LinkedIn. Here are some tips to help you get the best out of your LinkedIn experience and I’m more than happy to answer questions and help guide you, either through comments below or by direct email. Use a photo. Ensure you have a professional, or near professional photo of you – not a drawing, not a selfie, not a photo of something else, not your logo, but you. LinkedIn is about people and you fit into that category! Fill it out completely. Update the URL for your profile so you’re not using a series of numbers. 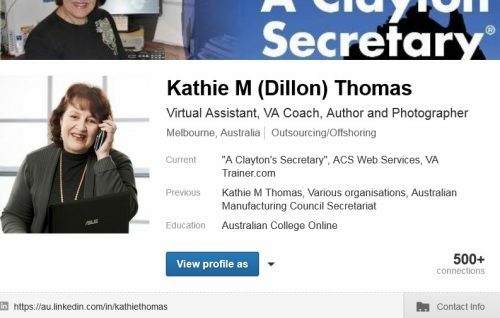 For example, my address is https://au.linkedin.com/in/kathiethomas. Create a summary that explains well who you are or what you do. Include any voluntary work you’ve done, awards you’ve received, positions you’ve held on committees or elsewhere. Look at other people’s profiles to see what they’ve done. A hint – Temporarily switch off ‘Notify your network’ to No. No-one needs to be constantly updated every time you make a change. You can switch it back later before publishing anything you do want your connections to know about. Connect with others. Don’t be shy or afraid to connect with other people. Don’t make it hard for them to connect with you either – be easily accessible. If someone sends you an invitation – check them out first before accepting and then send a personal thank you message. If sending an invitation to connect to someone – don’t just do it where LinkedIn suggests. Go view the profile of that person first, then click on Connect and from there you can personalise your invitation. This is far better to do. If you go to networking events and collect business cards of people you’ve met, look them up at LinkedIn and invite them to connect – start to build the relationship. Join LinkedIn Groups. A great way to meet more people online who may have a common interest or share something in the groups you join. You’ll get a number of invitations to connect but, likewise, you can also invite people to connect. This is a great way, also, to get in front of your target audience just by participating in discussions. Ask for recommendations. Not only that, but ask for them to comment on your top skills – determine what they are and get people to comment on these. Give recommendations but be stingy. Don’t give recommendations to people you don’t know well, or have no working experience with. It’s your reputation on the line so make sure you are comfortable giving recommendations to people who deserve it. Check your profile regularly and update it when needed. It’s good to have a fresh profile. Make sure you proof read over and over again. Build your numbers. The magic number is 501 so it shows 500+ connections but don’t stop there. Invitations I never sent. Are you getting acceptances from people for invitations you haven’t sent at LinkedIn? I’ve had the same thing happen. These are for people I do not know personally and would not be in any address contact list that I own. They are genuine in that I can go to LinkedIn and see the acceptance message, but I don’t know the people and have never conversed with them via a forum or other means. LinkedIn does have a discussion forum and there have been many people complaining about this same thing. You can see one of the threads here. The LinkedIn staff do oversight but often it can be a week or two, or more, before you hear from them. If you have a concern it is better that you contact them direct and not hold your breath waiting for a reply. Seems to me they’ve gotten too busy and don’t have enough staff to cope with the load. To add to the complication there have been fake invitation reminders sent out to people and they look like they’re coming from LinkedIn but aren’t really. Not something we really need. There’s a discussion about this here at LinkedIn. But it’s not really something LinkedIn can do anything about. Best to report the spam if you can ID the spammer, or delete it. What about if you have sent invitations that you now wish to withdraw? Perhaps you gave LinkedIn access to your address book and now regret doing that because it’s sending invitations to everyone, including your Vet, Doctor, or the parents of the kids down the street? You can withdraw them – but only one by one, which is a time wasting exercise. You’ll need to go to Invitations, then the Sent folder and click on the title for each invitation to view it, then click on Withdraw. Endorsements for things I don’t do. Have you been frustrated, like me, when people endorse you for skills you don’t have? Or perhaps they are people who have never used your services and don’t know you well at all? I feel the endorsement thing has been overused to the point that people don’t believe them or overlook them now. The Recommendations listed on your profile is much more believable and a better tool I feel. But apparently LinkedIn feel it has improved the amount of activity on their site – yes, because it’s in everyone’s face when they visit a profile, and perhaps they feel they have to endorse, or should, before leaving. If in doubt, I suggest you don’t – unless you know for sure that person really does that thing. Again, there is discussion about it here. You can remove endorsements you’ve accidentally accepted, again one-by-one. While I still feel that LinkedIn is a great tool for business I do believe it has gone overboard, perhaps feeling the need to compete with Facebook (heaven knows why, as it’s a completely different tool) or Twitter, or something. There’s room for all three.